For Selina Kyle, her early childhood was the beginning of her choosing her path in life. Her childhood was very difficult because both her parents lacked any capacity to raise her properly. She had an alcoholic father and a suicidal mother. Later Orphaned, she was placed in a state home but things weren't better here either as she was abused by the headmistress. Catwoman has often used her skills to steal priceless items and jewels which she would use to help support herself. She has to rely on her wits to evade the authorities and even Batman. Though she mostly commits capers to suit her own needs, Selina has at times taken time to help people who are in need though she won't admit her good deeds. -Catwoman's primary weapons are her Cat O' Nine tails whip and retractable claws in her gloves. 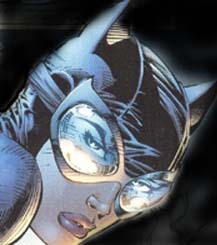 -Selina enjoyed a romance with Bruce Wayne during the early 80's. However due to the restart of the timelines, these stories were invalidated though recently it appears that they have been reinstated into Batman canon.